I first picked up Lavinia’s beautiful book, Writing Away, a few years ago after I returned with a suitcase of journals from my travels in Colombia. Five years later, I finally got the chance to sit down with her last month at the Tucson Festival of Books and talk about writing – something I’d been wanting to do for ages! 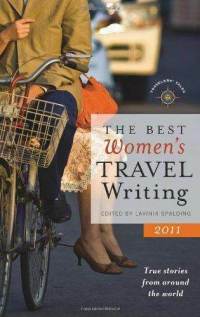 Lavinia, who is also the editor of The Best Women’s Travel Writing 2011 (a Book of the Year finalist! ), has a lot to say about keeping a journal, about making it in the digital world, and about what it’s been like to edit such a fantastic collection of women writers. Enjoy! When we leave home, all the conditions necessary to write hand themselves over in one perfect package: foreign scents and sounds and tastes, mysterious customs and concepts, oddball characters, surprises and disasters, the endless curiosities of a new place. How did you get started as a travel writer? What was it about the act of travel that inspired your work as a writer? I fell into travel writing by being a writer who traveled. Fresh out of college with a degree in creative writing, I moved to Busan, South Korea to teach ESL. I lived there for six years, traveling at least three or four months of each year. I’d never been exposed to such a bounty of writing material, and I kept journals and wrote constantly—but I was mostly focused on using my experiences as fodder for fiction – short stories, poems, and a novel I plugged away at for about ten years. It finally became clear sometime in my early thirties that even though my education was in fiction and poetry, it was much easier to become a working writer by pitching and submitting nonfiction. In terms of travel as a source of inspiration, there’s really nothing like it to crack open the creative mind. When we leave home, all the conditions necessary to write hand themselves over in one perfect package: foreign scents and sounds and tastes, mysterious customs and concepts, oddball characters, surprises and disasters, the endless curiosities of a new place. Add long stretches of free time and a change of location (invaluable writing tools, both) and lastly, throw yourself in the mix — the attentive traveler with fresh eyes. When you put it all together you’ve got the perfect recipe for storytelling. Let’s say you’ve got a dear friend who is interested in becoming a travel writer. What advice would you give to this person? And start small—write very short pieces about the town in which you currently live and about past travel experiences. Meanwhile, read travel stories of all kinds – pick up all the Travelers’ Tales anthologies and Lonely Planet collections, subscribe to AFAR, and peruse the travel sections of the New York Times, the San Francisco Chronicle, and the Los Angeles Times. Subscribe to online sites that specialize in travel essays, such as World Hum, Gadling, Perceptive Travel, and Recce. Take writing classes to work on your craft. Study accomplished travel writers and develop the habit of rewriting, setting aside your story and returning to it later, revising till it’s something you’re confident will still make you proud ten years from now. And attend a writing conference, such as the annual Book Passage Travel Writing, Food, and Photography Conference. It’s worth every penny because not only will you learn more than you can hope to remember, you’ll also connect with others in the industry—and personal relationships are just as important in this business as they are in any other. Finally—it should go without saying— travel, meet locals, take risks, get in trouble, and turn your journal notes into stories. Be brave and send out those submissions.